The 2018 Golden Globes were a marvel in monochrome — with glamorous guests like Emma Stone, Margot Robbie and Natalie Portman displaying their solidarity by dressing in black as a symbol of female empowerment. And Oprah Winfrey stole the spotlight from awards winners with a tour de force speech which even had the media speculating whether she’ll be considering running for president. But the Golden Globes of yesteryear have provided a showcase for some of the most spectacular, show stopping dresses of all time — let’s take a look at five of the best. Lupita Nyong’o was the breakout star of 2014 thanks to a screen-scorching performance in 12 Years a Slave. And the elegant red off-the-shoulder mermaid silhouette dress she wore to that year’s event sealed her status as a genuine superstar — it even featured a cape that added an extra touch of elegance. This outfit became instantly iconic, but Lupita has continued to thrill fans on red carpets since then with her uncompromising sense of style. Charlize Theron thoroughly deserved the Best Actress Golden Globe she won in 2004 for her astonishing performance as serial killer Aileen Wuornos in Monster. But the beautiful sleek, yellow evening dress she wore on the red carpet also hit the fashion headlines with its delicate décolletage and terrific train that brushed the red carpet beautifully. She’s since pushed boundaries in metallic mini-dresses, bold blazer suits and even designer bras worn as outerwear. Emily wore a stunning gold brocade cut-out gown to the awards event in 2013 and looked serene and stunning. She matched the dress with a stylish sparkly clutch bag and added a pink bracelet and earrings as an unusual colour contrast. She’ll hit cinema screens this year as a revamped Mary Poppins — keep your eyes peeled to see if Emily has added any classy couture enhancements to the famous nanny’s costume. The Basic Instinct and Casino star looked superb in a gold velveteen gown matched with a voluminous gunmetal grey wrap and silver clutch at the 1997 Golden Globes Awards. The actress has consistently punched above her weight in the red carpet style stakes for years, pioneering fauxhawk hairstyles, rocking aviator shades and always looking chic and sophisticated. Her first mainstream role was in Total Recall way back in 1990 — staying this glam for so long takes stamina. Foxcatcher and High-Rise star Sienna Miller looked like a Greek goddess in 2007 in a fabulous frock with a flowing white skirt and fitted off-the-shoulder bodice with metallic gold overlay. She complemented the look perfectly with a halo-braid hairstyle, gold oyster clutch and diamond drop earrings. The actress was born in New York and her mother Josephine is a former model — so it’s no surprise her sense of style is impeccable. The Oscars might be the most famous awards ceremony on the planet, but these five greatest Golden Globes dresses of all time prove that stars love to pull out all the stops for this brilliant bash too. 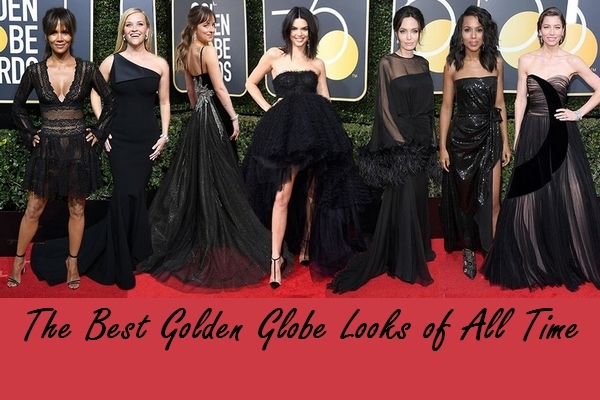 What’s your favourite Golden Globes dress? Share your thoughts in the comments section. Everyone looked amazing! My faves included Millie Bobby Brown, Helen Mirren and Diane Kruger. hai scelto i look più belli!!!! L’idea del look nero per tutte mi è piaciuta e le trovo nel complesso più chic! Hola! Todas iban espectaculares, saludos! These dresses are amazing and choosing black was a great decision! Amazing post and fantastic dresses dear! Our favourite look of this year´s gala belonged to Eva Longoria! She looked absolutely stunning. Quello di Kendall devo dire che non mi fa impazzire, anche se con quel fisico potrebbe permettersi qualsiasi cosa. Mi ha piaciuto moltisimo il abito di Lupita Nyong’o, lei eh una donna con molto buon gusto, sempre sceglia un abito meraviglioso! Spero che sia bene, una buona settimana per te! Baci! tutti i look che hai scelto sono tra i migliori di questa edizione anche secondo me! davvero glam! Queste donne sono un simbolo di eleganza e raffinatezza e queste foto lo dimostrano molto bene. Possiamo solo ispirarci da loro.